Motherhood is a lot of things. Messy, exhausting, hard, beautiful, wonderous, adventuresome, revitalizing....the list goes on. One thing that rarely describes motherhood, is regal. I SHOULD be a descriptive that is used often, along with elegant and graceful. I wanted to encapsulate that into a portrait, and the subjects in this photo were the absolute perfect people for this. No matter the struggle she went through to pack a bag and get to my studio on time - no matter how hesitant the little one was to sit still for a portrait - even though it was super hot and sweaty. Even though she didn't have her make up and hair done. None of that matters, when you are able to create a portrait like this. It's real, and it's breathtakingly beautiful. Does that seem strange that I'm saying that about a photo I took? I hope not. I would love to think I could repeat this image - but that is unlikely. 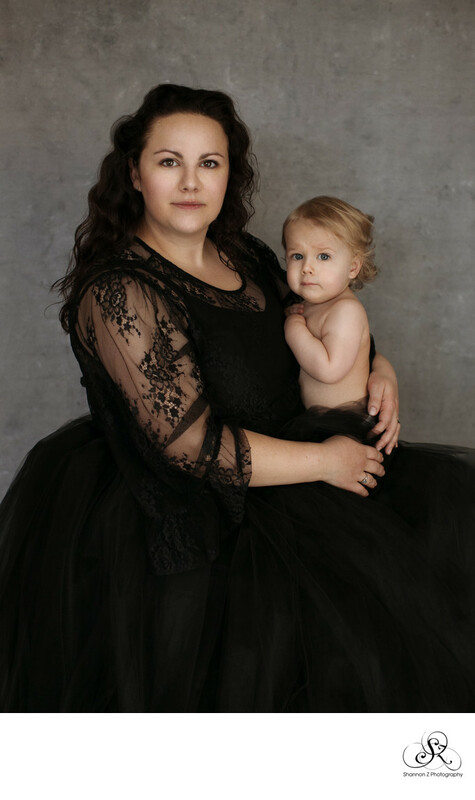 I'll surely be able to create another uniquely gorgeous portrait of a Mother and son, but THIS boy's personality, facial expression, perfect little blond curls? Not a chance I'll come across this chance again. I hope that he grows up, has a family of his own, and looks at this portrait of he and his mother with pride. I hope that he sees her strength, beauty and dedication with which she gave him life. The power of this portrait is indescribable to me. It will outlive this little boy. It truly is a legacy.